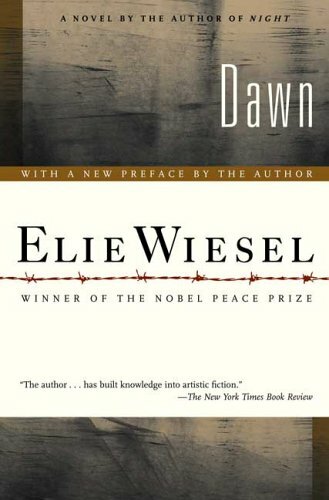 I read Dawn immediately after I finished Elie Wiesel’s best known book, Night. Like most of the amateur reviewers that I’ve read, I foolishly thought that this was a sequel to Night. In my defense, I was inclined to believe this because I have a book identifying this as the 2nd in the Elie Wiesel trilogy – another story, The Accident follows Dawn. I didn’t read any blurbs before diving into this book, which is another reason I was able to believe that it might focus on Wiesel’s life and personal experiences after the end of the Holocaust. The title itself left me feeling that it might be lighter; that, possibly, something very good happened in his life after all of the evil that he experienced in his life. Dawn, however, is very different. First, it’s a fictional story about a young man named Elisha taking part in a resistance movement against the English in a fight for a free Jewish state. But this isn’t where the main focus of the story lies. Almost all of the 96 pages cover a night leading up to two executions, scheduled to take place at dawn. The reader gets a glimpse into all of the thoughts, fears, and justifications that go through Elisha’s mind. This book is powerful. Like Night, it contains passages bound to stick with me for life. Wiesel’s books, unlike a lot of the other books that I have been reading lately, force me to stop and really think. I love it and look forward to reading more of his work. A man hates his enemy because he hates his own hate. He says to himself: This fellow, my enemy, has made me capable of hate. I hate him not because he’s my enemy, not because he hates me, but because he arouses me to hate. Buy a copy of Dawn on Amazon. shellystevenson reblogged this on Shellystevenson's Blog.